The Spinsterhood Diaries: Back From Vegas! My friend Tash and I got to Las Vegas late on Tuesday night, and when we checked in, Bally's Las Vegas didn't have the room with two queen beds I had booked. Instead, they upgraded us to a suite in the Jubilee Tower that was bigger than my apartment. It was magnificent. We had two bathrooms, a dining room table, a bar, a sofa, two sinks on either side of the shower, and a view of the Paris Hotel's Eiffel Tower. It was amazing and amazingly inexpensive. Bally's Las Vegas connects to Paris Las Vegas via a tunnel with restaurants and shops. Because my body was still on east coast time, I'd wake up around six every morning and have a stroll through the tunnel while having a coffee. 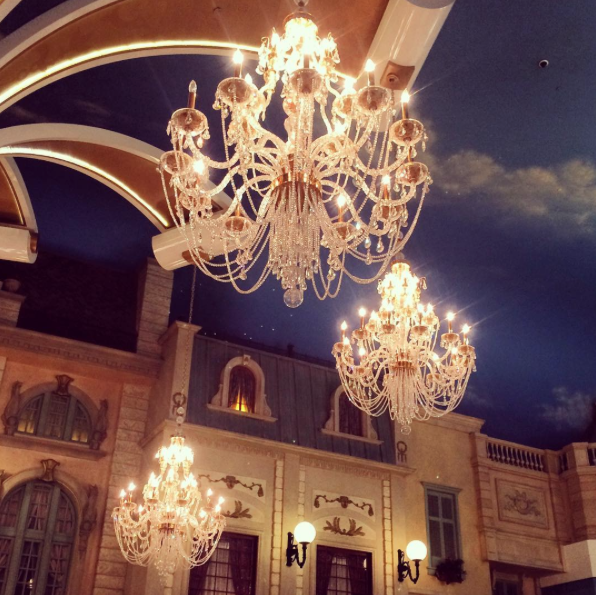 The photo above is from a little seating area with tufted sofas and chairs just outside of the casino in the Paris where I had my coffee one morning. It feels like you're sitting outdoors because of all the building facades, but you also get the benefits of air conditioning. Best of both worlds. We ordered room service for breakfast the next morning because, well, we had a dining room table, and we needed to use it. I know hotels charge a premium for room service, but I do so enjoy it. Were I a very wealthy spinster, I would surely order it more often. Wednesday night, we did a little tour of the craziest hotels - The Bellagio, Caesar's Palace, The Venetian, and several more that I honestly just can't remember right now. The sheer excess was a little dizzying. I can't help wonder how a town with so much redundancy survives. and yet it does. I will say that the architecture, aside from being marred by the presence of slot machines, is truly spectacular. One of my favorite things from this trip was a visit to the bar at the Mandarin Oriental that overlooks the strip. We had a plate of cheese, fruit, and charcuterie while we watched the sun set on the strip. Not only was it delicious, but it was really quite peaceful. The Mandarin has no casino, so it has a much more sophisticated and peaceful vibe. Another excellent choice was having a late lunch in the Paris's Eiffel Tower. The restaurant overlooks the fountains in front of the Bellagio, but it also has really delicious food and excellent service. I highly recommend this. All told, this was a fun first trip to Las Vegas. I feel like I'll go again, and I'll definitely be even more low key than I was this time. It's easy to get overwhelmed in that town. Also, an interesting tidbit: The cheapest/least crowded times to go to Las Vegas are in August and October. You can get some really good prices on hotel rooms, which I'm sure you know. What you may not know: If you book your flight through Spirit Air or Frontier, they now charge in excess of $50 for carryons. So, if you still want to fly with them, perhaps you should pack all your clothes in a backpack. All right! that's it from me. Happy Monday!